After summer ends, there comes fall…. Like in any other seasons, Russian people have a lot of things to do in fall before facing the cold winter. With the temperature dropping from 30 degree Celsius to below 20 degree Celsius. There is nothing to worry about the weather and Russian people keep on being happy, like there is nothing happening. They are still doing some activities outside, visiting museums, having picnic although the summer is over, taking part in some events and many other things. Here are 9 things Russian people love to do in fall season that may inspire you in the upcoming season. Did I say that Russian people usually have a picnic in fall season? Yes. They do. While there is no so much heat during the day, it is a great idea to have a picnic and enjoy cooler air. They usually do it in the park and bring a soft blanket to cover the lowering temperature. Bread, cheese and some fruits usually accompany their time. (Also read: Russian bread.) In addition to having a picnic, they can have a barbecue in their garden or back yard. During fall, Muscovites love to go to Kolomenskoye Park to enjoy a honey fair from September 15 to October 9. There are so many honey products and seasonal farmers’ product you can buy in the event. One of products that people love to have during the season is medovukha. Medovukha is actually an old Russian alcoholic drink of which alcohol content is varied, starting from 5 to 16 percent. However, unlike any other alcoholic drinks, medovukha’s base is honey. It is sweet and sometimes spiced with juniper, ginger, cinnamon, cloves and chili pepper. Also read: most popular autumn foods in Russia. There is no specific reason why Russian people do it in fall. However, you can see many Muscovites dancing on the embankment in Gorky park. They primarily do it in the evenings of the season. The type of dancing they do are tango, waltz, hustle and others. Although you can see that many people dancing in a large group, don’t hesitate to take part as it is free. Moreover, it is a great time for you to take a free dancing lesson, unless you will have to wait until the next spring. You may also like Russian Komi and Chuvash dances. As Russia as the longest and largest river in the world, Russian people use this to have a riverboat trip in the fall. The river navigation goes on until October, because after that, the weather will be so cold and some part of the river covered with snow. Taking the water trip, Russian people board at the pier near Novospassky Bridge. They can also buy daily tickets for 800 rubles or 400 rubles, for adults or children, respectively. Then, they enjoy such iconic Moscow sights along the trip. Those sights include monument of Peter the Great, the Kremlin, Cathedral of Christ the Savior, Krasny Oktyabr (a former chocolate factory that has been rebuilt as an art and design space), Krymsky Bridge, Gorky Park’s embankment, the Academy of Sciences, Moscow State University and Novodevichy Convent. Russian people also love to attend several events held in fall, including Cosmoscow. It is an international contemporary art fair that takes place within Moscow’s Gostiny Dvor. In the event, Russian people can see so many galleries with less than 5 years of age. The management select an artist of the year to exhibit all of his/ her work for the fair. Russian people usually also take part in this yearly marathon. The committee arrange the event to offer an opportunity for those who participate in the event to enjoy some iconic buildings in Moscow. 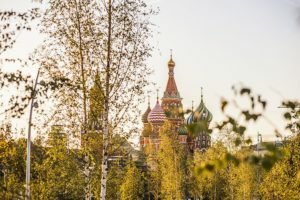 They purposely set the route, so runners can pass the Kremlin, the Cathedral of Christ the Savior, the Bolshoi Theatre, Moscow City, and four of the Seven Sisters skyscrapers. After the Paris Fashion Week pass, there come Russian Fashion Week. Like its counterpart, Russian Fashion Week also showcase some fashion products. Designers from all over the country go to Moscow to show their collections of art for the event. They mainly show their summer and spring lines to wow the media and potential buyers. There is nothing wrong with going to museums or enjoying some iconic buildings in any season. You may know that Russian people love history. They like to visit museum to enjoy some art and others. They also like to go to some iconic buildings to enjoy monuments, palaces and any others. Autumn is the beloved season in the country, as its national poet Alexander Pushkin said. It is the time when green leaves turn yellow, red and orange. Muscovites usually head to Gorky park or Tsaritsyno Museum and Park to have some photo session. They also go to Japanese Garden before all of the color fades. Peterburgers also do the same. The don’t want to miss the chance of enjoying the colorful day in fall. They go to the 18th century Summer Garden. They would also go to Gulf of Finland to enjoy fall sunset. Those are 9 things Russian people love to do in fall season.